(CNSNews.com) - Employment in manufacturing in the United States has increased by 189,000 in the year since Donald Trump was elected president, according to data released today by the Bureau of Labor Statistics. 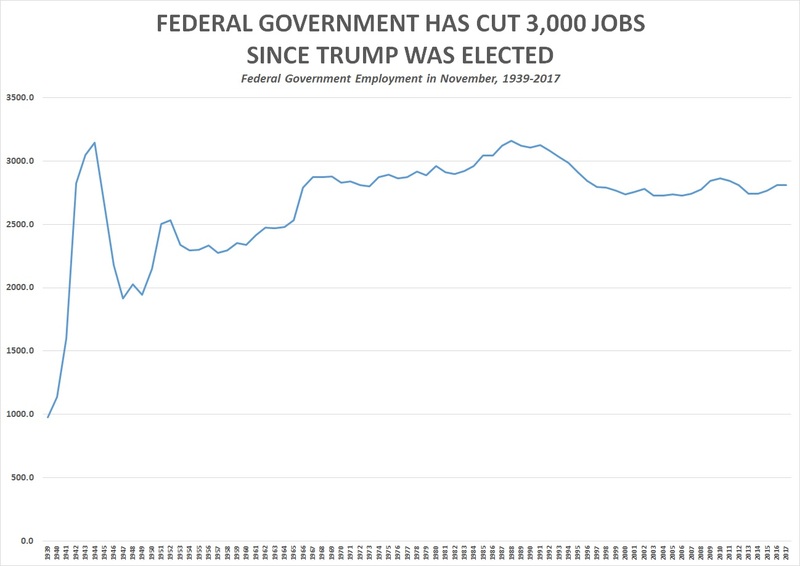 At the same time, employment in the federal government has declined by 3,000 since Trump was elected. In November 2016, there were 12,325,000 people employed in manufacturing in the United States. By this November, that had climbed to 12,514,000. “Since a recent low in November 2016, manufacturing employment has increased by 189,000,” the BLS said in the press release it put out this morning with the November employment numbers. The federal government employed 2,811,000 in November 2016. By this November, that was down to 2,808,000—a decline of 3,000. But at the same time federal government employment was declining, overall government employment in the United States was increasing as a result of increased government employment at the local level. In November 2016, there were 22,294,000 people employed at all levels of government in the United States. By this November, that had climbed to 22,341,000—an increase of 47,000. On the state level, as on the federal level, government employment declined. In November 2016, state governments employed 5,088,000. By November 2017, that had declined to 5,063,000—a decrease of 25,000. But local government employment increased by 75,000 in the past year, climbing from 14,395,000 in November 2016 to 14,470,000 in November 2017.